In the complex scenario that maxi yachts represent, with their different contaminated styles that struck me but also shocked me, I was pleasantly conquered by "Akhir 105's" interior design and in particular by its reviewed classic restyling. 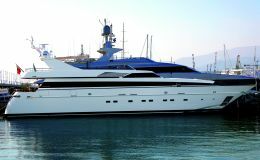 The project most certainly needed a refined tuning between the owner's oriental culture, the best tradition of the made in Italy, a characteristic the shipyard's and the project designer namely architect, Gianfranco Di Pierri. The final result was convincing not only because of the simplicity employed in dealing with luxury, in the noblest sense of the word, but also because of the relaxing atmosphere it generated. 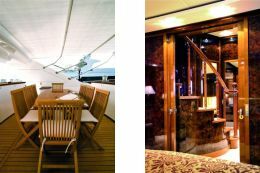 On board this yacht one is very much at ease, the eye pauses and gently spills over the details of the décor as a sense of peace and pleasure prevails. The refined taste of Param Jamuna's interiors is rounded off, so to speak, by an illustrious signature: Rubelli, a name which not only evokes Venice but is Venice throughout the world. 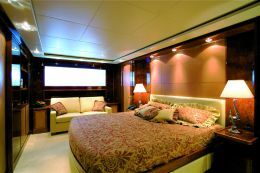 The fabric part of the furnishings is a perfect complement to the yacht's precious woods. A touch of colour? Something more perhaps, because if we compare photos of the interiors of Cantieri di Pisa 's Akhir 105 with the fabrics in Rubelli's latest collection we see at once that we're dealing with art here. The art of building yachts and the art of making fabrics come together perfectly. Sandro Rubelli, like a modern Capitano da Mar, may look proudly from the windows of Palazzo Spinelli on the Grand Canal towards the wide sea where boats like Param Jamuna sail: because after having conquered the world his brand is increasingly found aboard large and splendid yachts: it was inevitable! "Param Jamuna III's" style could be defined as being new classic with an exotic touch to it which well reflects Cantieri di Pisa's flexibility and ability in grasping diverse cultural influences and making them theirs. This craft is a fine example whereby classic designs have truly drawn from the orient such as the refined and weightless appearance of the décor which imparts an atmosphere that seems to emanate inebriating exotic essences. Her architect, Gianfranco Di Pierri, a cultured, kind, well educated man accompanied me on my visit of the interior, showing me every detail and I recollect listening to him in the quarters we were conversing in, as I watched the simply curled curtains, quaver in the sea breeze making me daydream over the Orient. The common theme of the saloon is the use of wood and its roots blended superbly. 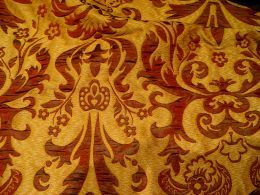 On entering, to the left, there are three sofas in silk and linen with wide stripes of colours that go from yellow to burnt brown passing through four intermediate shades of the colour and two cream coloured armchairs. Along the large windows, low articles of furniture run along them styled with savvy, laced by decorative patterns on their doors in tobacco coloured stitched leather strips. 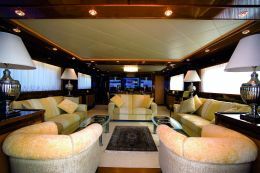 The whole area of the saloon is flooded by natural light which beams in from the four large windows which are screened by very light white silk curtains. The ceiling as the flooring brighten up the ambience in off white still further. The former is composed of diagonally positioned leather casings whilst the latter is covered by a closely woven plain carpet edged round by a wooden strip. Large wooden encasings which withhold spot lights in glass made in Murano divide the saloon from the dining area. Everywhere one looks one detects a determined choice of material, a whispered luxury and something close to loving care for every detail. The tables in between the sofas, as an example, convey the feeling only to well, they are in glass with an opal line running along the edge which is certainly decorative but it also avoids one from crashing into unseen sharp edges. Their base is in polished steel withholding a wooden sphere. On the whole there is a great atmosphere which permeates all the areas and even if the cruiser has all of the latest technological mechanisms these are discreetly placed if not hidden. Among the few precious objects in the décor there is a large jaguar curiously covered in scales of crocodile skin and a lobster also made of pewter bathed in gold. There are four specially designed lamp stands with polished pewter bases finished off with huge "white hats" which seem to define the dimensions of the saloon which in reality continues endlessly into the dining area. The ceiling, directly above the dining table has a beautiful opal rippled glass lamp by Artemide which softens the settings with its shape and light. The bulkhead at the bows has two electric roller doors lined in wood and leather strips and whilst the one to starboard leads to the bathing area, the opposite one, to port, opens onto the sleeping quarters. In between the doors there is an encased plasma screen, visible even from the saloon, which looks like a painting. Under it, there is an interesting sideboard with two enormous branched candlesticks and a silver fruit bowl. Either side of it there are two small wall halogen lights in glass and crystal. The beautiful dining table has a silver coloured base with a crystal glass top, at the centre of which, there is an opal pattern depicting the compass rose etched into the lower surface of the glass. The choice of the crockery too is part of this yachts lifestyle: the tall gold rimmed glasses in blown glass, Limoges porcelain plates, custom made cutlery in polished pewter with twirled handles recalling the shape of the "lines," all stored in meticulously measured wall cupboards and divided into appropriate plexiglass boxes on two levels, ready to sit as many as eighteen at table. The centrepiece consists of a round silver plate adorned with St. Jacques shells and a large crab that may be opened into a sauce bowl. From the dining room one may step into the study furnished with a sofa, a desk, library and naturally with all the mod cons to work on board. A nice bright coloured painting hangs on the wall above the sofa and depicts the reflection of wooden boats on the water. Should it be necessary the study may become the fifth double berthed cabin. Eating habits on board are strictly vegetarian and tailored to the needs of the different generations in a large family. 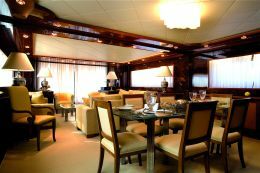 The galley, as accredited by the architect, is entirely created by Cantieri di Pisa, without his involvement, he said, and is situated at the bows of the yacht to isolate the crews quarters' from the owner's and above all to keep its odours out of the saloon. In itself the galley is formed by a peninsula at its centre, which actually divides it in two, comprising, to the left, a dining area with a sofa and table for the crew, to the right going in, the gas fires and sinks. The peninsula of course is made to perfection rounded off with curved doors to withhold appropriate goods according to the shipyard's best manufacturing tradition. Two large vertical Maytag deep freezers - fridges are situated in the walling at the back of the peninsula together with a large oven. 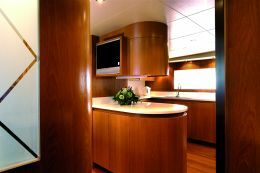 Teak is used throughout the whole galley including the flooring. It is interesting to note the space created for a laundrette forward of the galley composed of Miele washing and drying machines and two storage rooms. 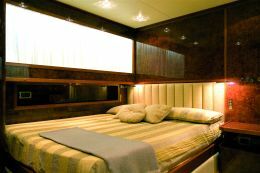 The crews quarters are also accessed from the galley as are the saloon and deck. Gianfranco Di Pierri's visit now led to the sleeping quarters. 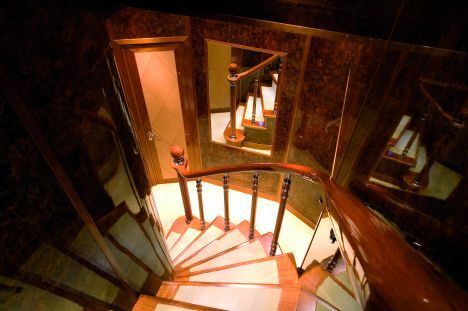 Wooden carpeted steps and a smart banister which rests on small columns decorated with metal silver coloured rings and spherical wood-turned lathes, brings one to an octagonal area that leads off to the sleeping quarters. Here two roller doors, in typical oriental style open onto the master cabin with a showy effect. The ceiling is, this time, covered in orthogonal leather casings in respect to its perimeter, whilst the wooden furniture and even the mirror have a leather pattern décor recalling the one in the saloon above. Bed Linen is by Elisabetta Paladini whilst the cashmere blankets are made by Vivai del Sud and the bedcover embellished by damasks is by Rubelli. On either side of the bed there is a polished bronze lamp stand shaped as "neo- classic" dolphins topped by two large white "caps." To port there is a boudoir table, to starboard a small sofa covered in straw like yellow silk cloth with small drawings by Rubelli again. In front of the berth there is a small library with anti roll bars and a low closet. The walk in wardrobe is splendid with its draw risers in glass and shelves with leather anti roll straps which remind one of old travel trunks. 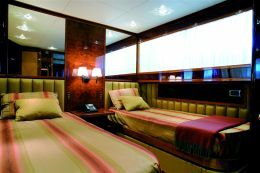 The difference between the double and Vip cabins can be noticed by the silk bed covers which, for the former, are striped in ecru with nuances that range from a red Bordeaux to pink whereas the latter are in a delicate sand colour. 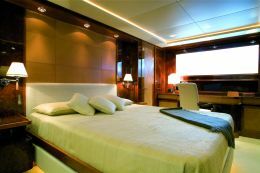 Though the vessel's interior may be of classic design, there are some very modern technological details worthy of note. For example, the headrests of the sun beds on the fly bridge are electrically adjustable, pop up plasma screens concur in the mod cons list just as Wi Fi internet systems do in every area, touch screens for every control, 5000 downloadable cds, TV decoders etc. At the end of the visit Gianfranco Pierri, the architect, admitted that he is in favour of a new classic design and that he recommends it to his clients, who only to frequently would allow themselves to be influenced by the fashion of the moment.